Super Hero Boy: Threadless tees are fun not just for adults! Threadless tees are fun not just for adults! Tired of boring baby tees with your standard lion or bear on them? Sure I think we all find something irresistible and adorable about those "regular" baby tees with the puppy dogs or little ducks on them but sometimes you just wanna make a statement. Threadless has an awesome selection of tee shirts for adults that are bound to make you giggle, like the my person favorite You've Got Some Splaining To Do. I'm half tempted to buy it for my hubbie for Valentine's Day lol but maybe thats a bad idea seeing we have a baby due any day now. heh. What you might not know is Threadless offers some of the same great tees as well as some pretty cool kid friendly designs in children's sizes! Threadless Kids has something for everyone and I'd have a pretty hard time choosing a favorite to be honest. Connor has been on a sweets kick lately including a new saying that still cracks me up... he holds up one finger and says "Just one cookie please.. just ONE!" 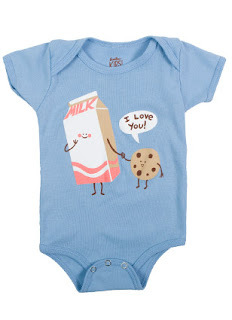 so Threadless sent him over the Cookie Loves Milk tee, after all what is a cookie without milk? What you may not realize is each Threadless Tee is a work of art. Each design is submitted by artists, actually anyone can submit a design, and the community votes on which designs make it to the tees. Some of the more popular designs get reprinted but for the most part if you see something you really can not live without its best you go ahead and pick it up as you never know which designs will get reprinted or not. Either way there is always something new and cool to look at on the Threadless site and you can almost rest assured your kid will be the only kid at the birthday party wearing your favorite Threadless tee, unless of course you have some pretty cool friends. You can see the entire selection of Threadless Kids tees on the threadless website. Personally I really wanna get the baby a Clean Monster Tee!